Every now and then I stumble across a graph in a paper that blows me away. Some show patterns I hadn’t imagined, while others show patterns far stronger than I’d thought possible. The other day I came across an ‘in your face’ graph that’s worth sharing. In fragmented landscapes, the structure of the vegetation within a remnant strongly influences the fauna that lives there. But the vegetation outside the remnant is also important. In a recent paper, David Lindenmayer and colleagues documented how the bird composition of small woodland patches changed as pine plantations (Pinus radiata) grew up around the woodlands. At the start of the study, the woodland patches were surrounded by open paddocks with scattered trees. At the end of the study (just 7 years later), the patches were surrounded by young pine forests. These growing forests caused big changes to the birds that lived in the remnant woodlands. The figure below is my mind-blowing graph of the day. The chart shows how the bird composition of the woodland remnants changed as the young pine forests grew up. 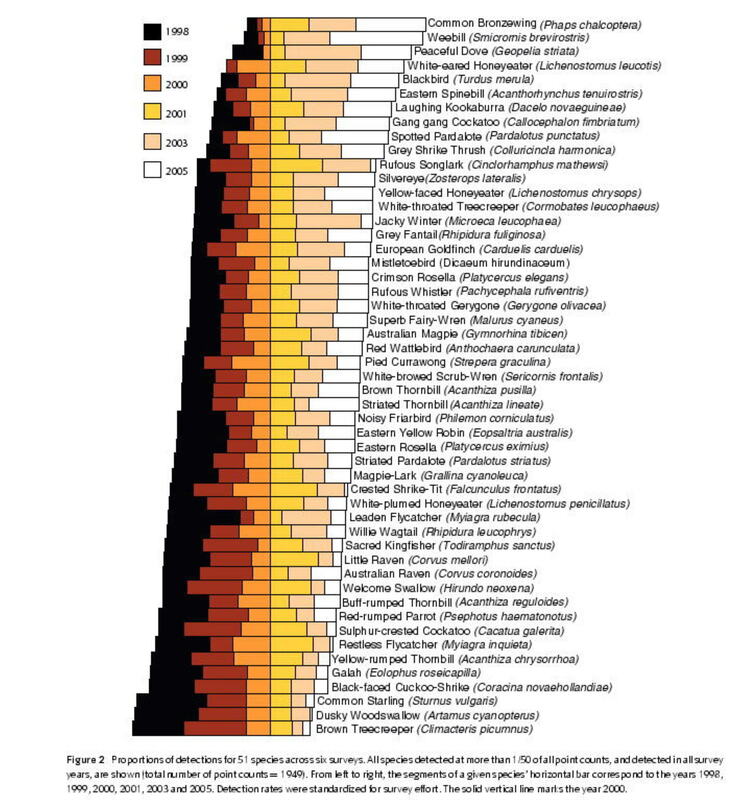 The black bars show how often each bird species was seen in the first census (before pines were planted), and the white bars show how often each species was seen in the final census, 7 years later. The other colours represent surveys between these two dates. The bars are arranged so that birds that increased over time are at the top, and those that declined are at the bottom. Changes in the bird composition of woodland patches, as pine plantations grew up around the woodlands. Figure from Lindenmayer et al. (2008). Click on the image to view in full screen mode. As you can see, common bronzewings, weebills and peaceful doves were the big winners, while brown treecreepers, dusky woodswallows and introduced starlings were the biggest losers. Additionally, some species (including speckled warblers) disappeared completely from the area, while a number of classic ‘forest birds’ colonized the area, including olive whistlers, satin bowerbirds and even superb lyrebirds. Overall, the chart shows a change from birds that like grasslands and open woodlands, to birds that like dense forests. We’d expect changes like these if the researchers had surveyed the open paddocks as they changed into pine plantations. But the surveys weren’t conducted in the paddocks, they were in the woodlands that were surrounded at first by paddocks and later by pines. The new pine forests led to big changes in the birds in the woodlands, and these changes happened very quickly – in just 7 years in this example. I find the magnitude of these changes quite extraordinary. I imagined that the birds would change over time, but not this much, and not this quickly. Imagine how different the birds will be in another 20 years, when the pine plantations are tall and dense. 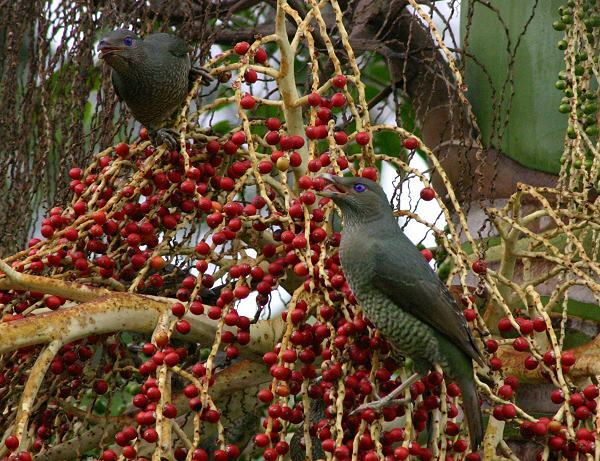 Satin Bowerbirds eating palm-tree fruits (Source: Australian Natural History Safari. In the long-term these changes won’t just affect birds. Birds aren’t just ‘passengers’ in ecosystems, they also change the ecosystems they live in. They pollinate flowers, disperse seeds, eat insects and lots more. As the birds change, these functions will change, with flow-on effects on other biota, perhaps on the woodlands as a whole. Two of the notable ‘increaser’ species were satin bowerbirds and introduced blackbirds. Both species disperse the seeds of fleshy-fruited plants. Not many native woodland plants have fleshy fruits (the flax-lilies, Dianella species, come to mind), but many exotic plants do. Invasive plants like blackberries, hawthorn, briar-rose and the native Pittosporum undulatum (which has spread from wet forests into other ecosystems in many regions) all have fleshy fruits. Based on this graph alone, we can expect woodland plants will change over time, as blackbirds and bowerbirds become more abundant, and disperse more and more fleshy fruits. Many other changes will also take place. In conservation, it’s often hard to stop important remnants from being destroyed and replaced by other human land uses. It’s even harder to stop other land uses from being built next to important remnants, even when we know that the new activities will degrade the patches we want to conserve. The chart above highlights how strongly surrounding landscapes can affect small remnants. When the neighborhood changes, owning the best house on a bad block ain’t a great investment. Gosper CR, Stansbury, CD & Vivian-Smith G (2005) Seed dispersal of fleshy-fruited invasive plants by birds: contributing factors and management options. Diversity and Distributions 11(6), 549-558. [You can download a free copy of this article from this link]. Lindenmayer DB, Fischer J, Felton A, Crane M, Michael D, Macgregor C, Montague-Drake R, Manning A & Hobbs RJ (2008) Novel ecosystems resulting from landscape transformation create dilemmas for modern conservation practice. Conservation Letters 1, 129-135. [You can download a free copy of this article from this link]. All kidding aside, this is a fantastic paper. Thanks for sharing it. I may have to figure out how to repost it on my blog without losing face, following my recent “anti bird” post! Seriously, though – Thanks for directing us to Ian’s blog this week. Hello, Ian. Hope to be back again for more. The picture at the header is fabulous. I want to be there! And the graph is indeed one of the more poignant ones I’ve encountered lately. It is at least a little encouraging, in spite of all the bad news it reports, that starlings declined.